Gomma currently is on holiday! Since 2016 we stopped our activities and started 2 other labels: Toy Tonics & Kryptox. Gomma was born in 2000. Created, curated and directed by Mathias „Munk“ Modica and Jonas Imbery, who later left the label. Art direction by Mirko Borsche & Thomas Kartsolis aka Smal & Paze. WhoMadeWho, Munk, Headman, The Phenomenal Handclap Band, Moullinex, Mocky, Daniel Avery, Dimitri from Paris, Lele (aka Parra), Tomas „Tomboy“ Barfod, Box Codax (Franz Ferdinand side project) and others. We made art and visual projects, published the graphic magazine Amore and curated exhibitions in galleries around the world. Gomma retrospectives have taken place in Munich (Haus der Kunst), Stockholm (Beneath gallery), Berlin (Circle Culture), Tokio (with 032C magazine) and other cities. We produced over 50 different limited editon design shirts. Designed by Mirko Borsche, Thomas Kartsolis, P.A.M., Kostas Murkudis, Mathias Modica. We made music for shows, events and campaigns of fashionbrands such as Margiela, Wood Wood, Surface to Air, Chanel and worked for Parisian fashion institution Colette. As you might know Nancy from LCD Soundsystem did a little solo project on Gomma. Reworks of legendary tracks from the Casablanca catalogue. 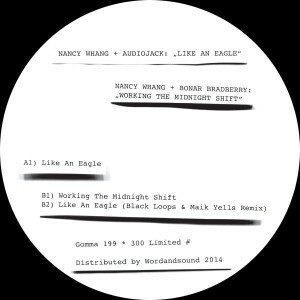 Two of the five songs came out on vinyl this week: Nancy’s collaboration with Bonar Bradberry (Donna Summers’ “Working The Midnight Shift”) and the one with Audiojack (“Like An Eagle”).